Life is like a knot - full of twists and turns and no two directions are ever the same. I graduated from Cal Poly San Luis Obispo with a degree in Architecture. In college, I learned architectural design was not just about buildings, but rather developing an idea into an attractive package that functions efficiently. The art of design is in the seamless union of form and function - so that the final creation, simply put, works well and looks good. My dad - a merchant seaman for over 50 years - had taught me this art in its purest form when he showed me this unique monkey fist knot he'd learned to make while away at sea. Deconstructed, this extraordinary knot had the same basic components I'd been using on a larger scale with building design: raw materials combined in a resourceful way to create something aesthetically pleasing and remarkably functional. When money became tight (college is NOT cheap - you know), I grabbed some paracord and steel balls, taught myself web design and with a clever play on words - an eBay pastime quickly developed into Monkey Knuts®. 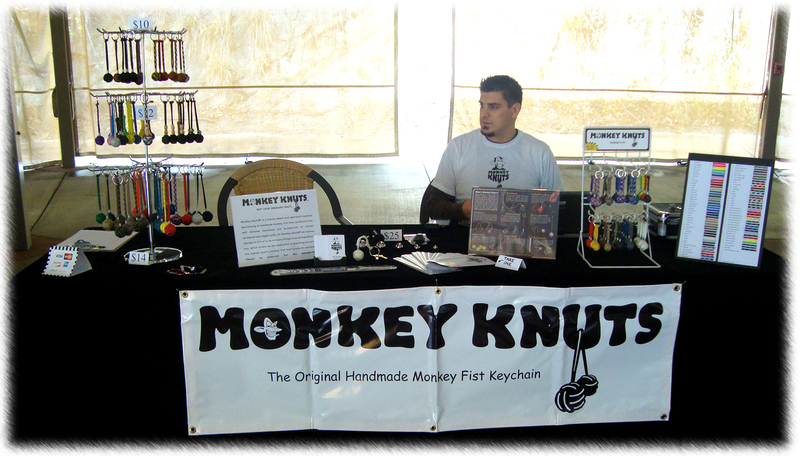 Monkey Knuts® is a family-owned and operated business located in San Deigo, California. Since our company began in 2007, we’ve treated every customer like they were a part of our family. Other companies may offer similar paracord products, but our attention to detail and commitment to customer satisfaction are top-notch, and come with a personal touch. Every monkey fist keychain, paracord necklace and survival bracelet is handmade to order by us here in the USA, and every item is thoroughly inspected prior to shipping. We want you to know our dedication to quality and craftsmanship are of the utmost importance to us and we can assure you that you're in safe hands. Although life can seem complicated at times (like our knots) - it is really pretty simple: Be happy. Be sustained. Be prepared. You never know where life is going to take you. And always remember: "Luck favors the prepared." It’s a jungle out there, and with so many obstacles to overcome you never want to be caught empty handed. We believe the key to life is to do ordinary things in an extraordinary way, which is why we are dedicated to providing the finest handmade monkey fist keychains and paracord products available. Monkey Knuts® ensures you will always be prepared for the unexpected!